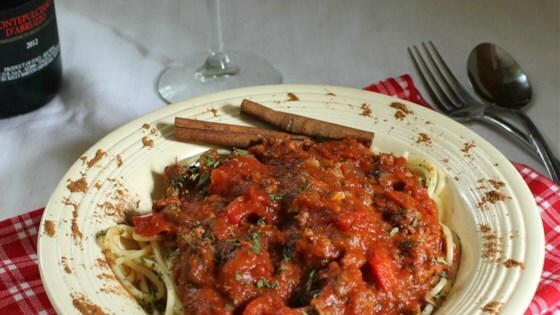 "The delightful surprise ingredient in this sauce is cinnamon, and I guarantee that it's absolutely delicious! In the military, the term "field grade" is for Colonels and Generals, as in "He's a field grade officer." That's how this recipe got it's name...by being the cream of the crop! It's one of the many recipes I've accumulated as a military wife for almost 30 years. This sauce freezes well." Mix in dry onion soup mix, mushrooms, basil, salt and pepper, cinnamon, allspice, parsley, crushed tomatoes, tomato paste, and water. Cover pan almost completely, allowing space for steam to escape, and simmer 1 hour. Add additional water if needed to prevent sticking. This is thick and very good. I like a stronger tomato flavor, so I added a can of tomato paste. Smells wonderful, too! It was very good but be careful with the cinnamon. I did not have allspice so I upped the cinnamon a tad. Do not add extra cinnamon. If anything, use a little less than is recommended.